Tailor cakes to suit any preference or mood, with absolute success each and every time? 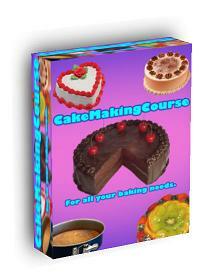 All of this is available to you through the masterpiece program Cake Making Course! This is an easy-to-make apple and blackberry crumble recipe. If you wish, you can use a ready-made crumble topping mix (you can buy these in supermarkets) instead of mixing butter, flour and sugar to make your own topping. Wash the blackberries, mash them up a bit using a potato masher, and place in a cooking pot. Peel and core the apples, removing all skin, stalks, seeds, etc., and then cut the apple cut into small pieces, and add to the cooking pot. Place the cooking pot over a low heat, and allow the apple and blackberry mixture to simmer for about 15 to 20 minutes. Gradually, the apple and blackberry sauce will thicken (you do not wish to produce jam however!). Towards, the end you should taste the apple sauce mixture, and if it is very sour, add a little sugar to it, and mix it in. Prepare the crumble topping, by sifting the flour into a bowl, adding about 1 ounce of butter (cut into cubes) and about 2 ounces of sugar. Mix together until you achieve a crumbly mixture. If you wish, instead of preparing the topping yourself, you can buy a ready-made crumble topping mix from a supermarket (a 8 ounces - 225 gram) packet should be enough. Use the rest of the butter to grease an oven-proof bowl. Poor the apple and blackberry mixture into the greated bowl, and then cover it with a layer of the crumble topping. 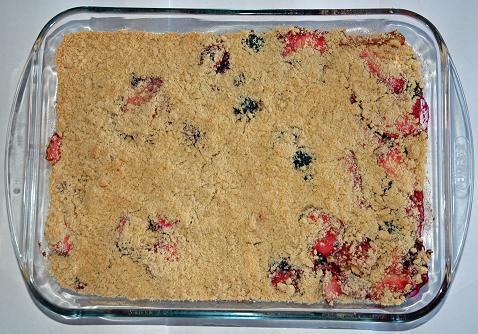 Try to spread the crumble topping as evenly as possible, and press it down lightly with the back of the spoon. Place the crumble bowl into a oven preheated to 375°F (190°C; Gas Mark 5) for about 20 minutes, or until the top begins to turn golden brown. Remove from the oven, and serve your apple and blackberry crumble with cream, custard, or ice cream. Chocolate Matters! Chocolate Recipes For A Happy Heart And Soul. 135 delicious chocolate desserts from the culinary queens of 100 years ago.